Is a high potency homeopathic remedy that supports cardiovascular regulation. It provides temporary relief from constriction of the chest cavity, heart sensitivity, difficulty in breathing and swelling of the ankles. 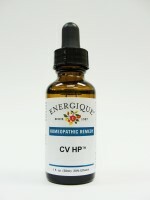 CV HP contains Lycopus virginicus 30x, Crataegus oxyacantha et monogyna 30x, Valeriana officinalis 30x, Adonis vernalis 30x, Phosphorus 30c, Cactus grandiflorus 30c, Digitalis purpurea 30c, Aurum metallicum 30c, Natrum muriaticum 30c, Pulsatilla nigricans 30c and distilled water. 20% ethanol.